Users often ask how much RAM is required for a de novo genome assembly in Lasergene Genomics Suite, and we addressed that question for Lasergene 12 users in an earlier blog post. We’re excited to announce that with the release of Lasergene 13, RAM requirements for de novo genome assembly are significantly decreased, with the greatest improvements seen in assemblies of longer genomes and deeper coverage. 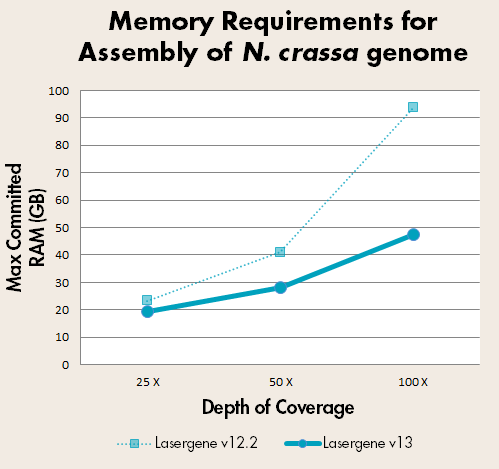 Let’s take a look at the memory requirement for genome assembly in Lasergene 13 compared to Lasergene 12. The graph below shows total memory usage vs. genome length for Illumina 2×100 paired end data sets for four organisms: Escherichia coli, Saccharomyces cerevisiae, Neurospora crassa, and Caenorhabditis elegans, each assembled using a target coverage of 50x in SeqMan NGen. Here we see up to a 50% reduction in RAM usage, with the largest improvement seen in the longer genomes. 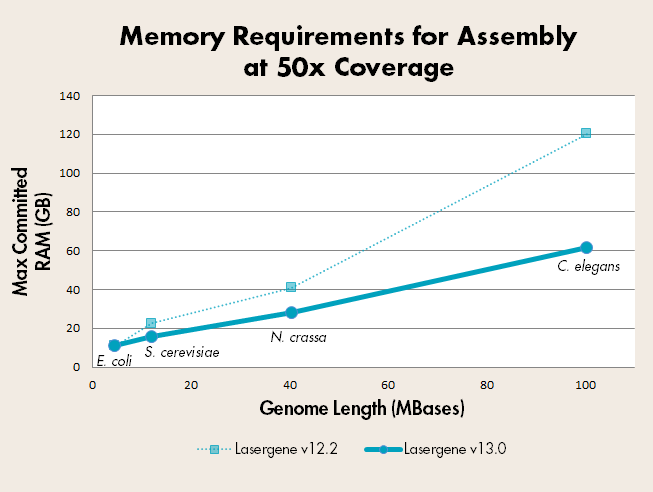 With the improved algorithms in Lasergene 13, the C. elegans genome can now be assembled on a desktop computer with 64 GB RAM. With each new release of Lasergene, we strive to add more functionality for our users, but also to improve the quality and accessibility of our software. With the reduction in RAM required for de novo genome assemblies, it is now more feasible than ever to do this work on a desktop computer. Learn more about the Lasergene Genomics Suite here, or request a fully-functional free trial to perform your own assembly and analysis projects.